Hail damage to a roof is a very serious issue and the damage can range from minor to very severe. Often hail damage to a roof can go unnoticed for a long time. Many times homeowners only realize that a hail storm was the root of the damage and sometimes it’s way too late to collect insurance. 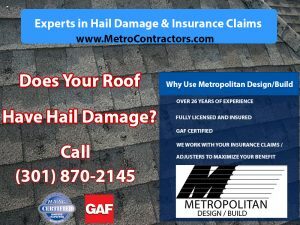 The cost to repair a roof because of hail can be costly! When a passing hail storm moves over an area, a shingled roof is beaten up by the ice pellets or in some cases baseball-sized chunks of ice. Roof leaks are often noticed following a hail storm. It is not uncommon, and homeowners many times fail to realize that the recent hail storm was the culprit for a roof leak or problem. Damage caused by a hail storm can come in a variety of ways. Shingles are pounded by the hail and the granules that make up the outermost shell of the shingle are beaten off causing dimples, reducing the overall life of the roof shingle. Sometimes holes can be found following a hail storm. A sign that roofs shingles have been beaten by hail is the buildup of the shingle granules in the rain gutters. It is not uncommon to see extremely large deposits in the gutters. Shingles can become softened and bruised exposing the under fibers to become exposed. Hail can also cause marks and dents on metal roof venting systems. Many times the damage is severe and it may look like the metal covers were hit with a hammer. Once the roof is damaged water can leak into a home and can cause a host of expensive damage to a home. Common issues are water stains on drywall, mold, unpleasant odors, rotten roof trusses, wood rot on underlayment boards and many other water-related issues — large and small. The best way to prevent any of the many problems following a hail storm is to have your roof inspected and carefully examined by a professional roofing contractor for any potential damage as soon as possible following a hailstorm. If problems are found early, they can be addressed and prevent extensive and further damage. If your home shows signs of severe hail damage, you may be eligible to file a claim with your insurance company to help pay for repairs. An experienced knowledgeable roofing contractor such as Metropolitan Design/Build has the expertise to assist you in filing a claim in order to make your roof repairs. Filing an insurance claim with an insurance company can be very tricky and is best left to a professional. Insurance adjusters and the companies they represent have very strict guidelines for such circumstances. We have relationships with many of the top insurance companies and can make the process much easier. 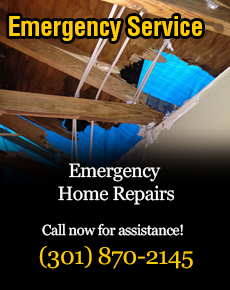 If you have experienced a significant hail storm and possibly have damage to your home, we can help. Golf ball sized hail ranging from one inch to four inches in diameter along with strong winds means you may have sustained damage to your homes roof.